(Hatay) – Iraqi, Jordanian, and Turkish border guards are pushing back tens of thousands of people trying to flee Syria. Iraq, Jordan, and Turkey have either closed numerous border crossings entirely or allowed only limited numbers of Syrians to cross, leaving tens of thousands stranded in dangerous conditions in Syria’s conflict-ridden border regions. Only Lebanon has an open border policy for Syrians fleeing the conflict. On June 25, 2013, airstrikes reportedly hit the Syrian Bab al-Salam camp for displaced Syrians near the Turkish border, where thousands of people have been stuck since August 2012 because Turkey refuses them entry.A Syrian activist who visited the camp on June 26 told Human Rights Watch that the attacks injured seven people and residents. He said that the seven were allowed into Turkey for treatment but that the Turkish authorities had kept the nearby border crossing closed, despite protests from Syrians living in the Bab al-Salam camp. Although Jordan denies it has closed its borders, recently arrived Syrian refugees in Jordan say that Jordanian border guards blocked their and others’ entry for days or weeks in May. Since late 2011, Jordan has prevented Palestinians, Iraqis, single military-aged men, and anyone without identity documents from entering Jordan. Authorities in Iraq’s semi-autonomous Kurdistan Regional Government (KRG) admit that they closed their border with Syria in May, and that since mid-June only some Syrians in need of emergency humanitarian assistance have been allowed to cross. Authorities in central Iraq maintain that they will admit “urgent humanitarian cases” and family reunification cases. But they have severely limited the number of Syrians allowed to enter since August 2012, and new arrivals virtually ceased in late March. Turkey is blocking the entry of thousands of Syrians at the Bab al-Salam, Atma, and other border crossings with Syria. Turkey only sporadically allows small numbers from the Bab al-Salam camp and other displaced Syrian camps in Syria close to the Turkish border to cross into Turkey, with thousands blocked for weeks or months inside Syria. In October, a senior Turkish official told Human Rights Watch that the country’s refugee camps were full and said that instead of allowing more Syrian refugees to enter, the government was making sure that assistance reached Syrians in areas close to the border. According to the United Nations High Commissioner for Refugees (UNHCR), as of mid-June Jordan was hosting over 480,000 Syrian refugees who were either already registered or being registered by UNHCR, while Turkey was hosting over 387,000, and Iraq over 158,000. Lebanon has over 550,000 UNHCR-registered or registering Syrian refugees, adding approximately 10 per cent to its population, while the Lebanese government estimates the number of Syrians in the country at more than one million. International donors should urge Syria’s neighbors to keep their borders open to asylum seekers. The donors should also provide generous financial support to humanitarian agencies addressing the refugee crisis and operational support to the governments of Turkey, Iraq, Jordan, and Lebanon, Human Rights Watch said. For further details about the border closures, and extracts of interviews with Syrian refugees blocked at the Jordanian border, please see below. As of June 25, UNHCR had registered 159,140 mostly Syrian Kurds in Iraq. About 5,500 live in the al-Qa’im camp, while the rest live in Iraq’s Kurdistan region: about 60,000 in Domiz camp and about 100,000 others who mostly live in Duhok city, about 60 kilometers from the Syrian border. Despite taking in these numbers, the Iraqi authorities have blocked thousands, and possibly tens of thousands, of Syrians at the border. In mid-August 2012, senior officials in Baghdad ordered local authorities and the Ministry of Displacement and Migration to close the al-Qa’im border crossing, located near al-Qa’im town in Iraq’s Anbar province and near the Syrian town of Abu Kamal. The local authorities told Human Rights Watch that they were reluctant to close the border but had to comply with the orders from Baghdad. In late August, Salam al-Khafaji, Iraq’s deputy displacement and migration minister, told Human Rights Watch the authorities had closed the crossing to everyone while they expanded the nearby al-Qa’im refugee camp, which was sheltering a few thousands refugees. However, other senior officials said the crossing had been closed for security reasons, and implied that al-Qaeda operatives might use it to enter Iraq. The authorities re-opened the crossing on September 18, but refused entry to all single men of military age and limited the entry of other refugees, citing security concerns. In late September, Syrians stranded on the Syrian side told Human Rights Watch that they and thousands of others had not been allowed to cross into Iraq since mid-August. In late October, a local aid agency told Human Rights Watch that between September 24 and October 10, Iraqi authorities allowed only about 125 people to cross per day. On October 15, Human Rights Watch called on Iraqi authorities to reopen the crossing. On June 13, Iraq’s Interior Ministry spokesperson, Saad Maan, told Human Rights Watch that the Interior Ministry controlled central Iraq’s border crossings and that the al-Qa’im crossing had been closed to all refugees since October. On June 13, the mayor of al-Qaim told Human Rights Watch al-Qa’im had been closed for “humanitarian reasons,” but did not elaborate. On June 18, al-Khafaji acknowledged the al-Qa’im border closure, but told Human Rights Watch the border was “not entirely closed” and that since October a limited but unknown number of Syrians facing “humanitarian emergencies” had been allowed to cross. UNHCR and local aid agencies say that between October and late March 2013, the authorities allowed only a few Syrian refugees to cross at al-Qa’im, mainly for family reunification purposes. On June 4, UNHCR said the authorities had completely closed al-Qa’im at the end of March, which had the effect of “impeding … Syrians seeking refuge in [Iraq’s] Anbar Governorate” and has “led to the return of many registered refugees to Syria as they can no longer bring family members into Iraq, in addition to not being able to access the labor market” in al-Qa’im. The Iraqi government should immediately reopen the al-Qa’im border crossing and allow to UNHCR to register Syrians as they cross, Human Rights Watch said. UNHCR says that since October, most Syrian refugees trying to enter Iraq have only been allowed to cross into Iraq’s Kurdistan region through the unofficial Peshkapor border crossing, which the Kurdistan Regional Government (KRG) administers. The crossing is about 20 kilometers from Duhok city and 60 kilometers from the Domiz refugee camp. In June, Human Rights Watch spoke with a number of local officials and aid agency staff working with Syrian refugees, who confirmed the closure and gave different explanations for it. A staff member of a local aid agency told Human Rights Watch that the KRG and Iraqi central government had agreed to close the border temporarily because of poor conditions in the severely overcrowded Domiz camp. On April 2, UNHCR reported that the camp sheltered 35,000 people and was “critically overcrowded.” According to camp residents and local aid workers, as of late June the camp sheltered around 60,000 people. A person in contact with Syrian opposition officials said the KRG authorities had closed the border while they discuss new plans to share revenues from the border crossing with Syrian officials. Other sources said the KRG’s President, Massoud Barzani, personally ordered the closure after the Democratic Union Party (PYD) in Syria allegedly detained 75 members of the Syrian Kurdistan Democratic Party (KDP) in mid-May. On June 18 a local aid worker told Human Rights Watch that the authorities had opened the border the day before to allow “humanitarian emergencies” to cross and that the KRG Interior Ministry had said the border would reopen by the end of June. In late June, a UNHCR official told Human Rights Watch that KRG authorities partially opened the border on May 29 to allow Syrians wishing to return home to leave Iraq and that the authorities had allowed a very limited number of people to cross on “exceptional humanitarian grounds, [such as] medical [and] family re-unification [cases] or of third country nationals,” and on an ad hoc basis. Human Rights Watch said it was concerned by UNHCR statements that KRG authorities reopened the crossing in June only to allow Syrians to return to Syria. In mid-June, aid workers told Human Rights Watch that KRG authorities had pledged to build a new refugee camp near the town of Duhok, and that the KRG authorities would reopen the border crossing at the end of June. KRG officials have not responded to Human Rights Watch requests for official comment on the border closure. Human Rights Watch said it was also concerned by reports from aid workers in the area that since mid-June, hundreds of people have been stranded in Syria, just across the border from the Peshkapor crossing, and are at risk of violence, disease, and food shortages. The Iraqi and KRG governments should immediately reopen the al-Qa’im and Peshkapor border crossings and allow UNHCR to register Syrians as they cross. The KRG authorities should also fulfill their pledge to build a new refugee camp near Duhok, to reduce overcrowding at the Domiz refugee camp. As of June, UNHCR had registered or was registering over 480,000 Syrian refugees in Jordan. However, Jordanian authorities are preventing thousands, and possibly tens of thousands, of Palestinian and Iraqi refugees, single males, and undocumented people fleeing the Syrian conflict from crossing into Jordan. Human Rights Watch first reported on Jordan’s border pushbacks and forced return of Palestinian refugees trying to flee Syria in July 2012. In March 2013 Human Rights Watch also reported on Jordan’s rejection since late 2011 of Palestinian and Iraqi refugees, single males and undocumented people seeking asylum at its border with Syria. Since late May 2013, Jordanian authorities have also temporarily prevented thousands of Syrians from crossing into Jordan to seek refuge, according to local and international aid agencies and refugees who spoke with Human Rights Watch. Jordanian Royal Court officials told Human Rights Watch on May 27 that border authorities had neither closed the border nor limited the number of refugees permitted to enter. They said that fierce fighting in the border area and the Syrian armed forces’ deliberate targeting of fleeing refugees had prevented refugees from reaching the border. However, refugees who spoke to Human Rights Watch after they entered Jordan only with great difficulty in the second half of May said that Jordanian border officials were also responsible for the decrease in the number of refugees entering Jordan. Some said that officials told them that the border was temporarily closed, while others claimed that officials said they were limiting the number of refugees allowed to enter Jordan to 150 each day. In mid-May, there was a sharp reduction in the number of Syrian refugees arriving in Jordan. Between March and May, UNHCR registered between 1,000 and 2,000 every day in the Za’tari camp. Between May 11 and May 16, the International Organization for Migration (IOM) – which pre-registers Syrian asylum seekers as they cross the border into Jordan before transporting them to the Za’tari refugee camp for UNHCR formal registration – registered an average of 1,553 a day. On May 17, IOM registered only 369 people and on May 18, the figure dropped to 107. Between May 19 and May 23, only 34 people were registered and the daily average between May 24 and May 27 was 133. At the end of May, the numbers increased again but then varied considerably over the coming weeks: 1,328 on May 28, extreme variations between May 29 and June 4 with a high of 982 and a low of 48, and between June 5 and 15 an average of 430 per day. Although Jordanian officials deny closing the border and attributed the fluctuation to fighting near the border, eight refugees who finally managed to cross the border in May told Human Rights Watch that Jordanian officials had tried to prevent them and many others from crossing. They said officials told them the border was temporarily closed to all refugees or that only between 50 and 150 people would be allowed to cross each day. At first we came through the official border with our passports … We went to the Jordanian side to get [our passports] stamped to go through. First they stamped it but then they cancelled the stamp and we had to go back to Syria. They just yelled and screamed at you: “get out of here, go back to Syria!”…. They left us at the Syrian entrance to the Jaber border crossing. We sat on the ground. We stayed there for eight days. There were a lot of people, maybe 50 or 60 families. They didn’t say why we had to stay there. The [Jordanian] security said if you can bring someone who can vouch for you, if you know someone, then you can go in [the border]…They just didn’t allow us to get too close to their border. They yelled at us, “Why are you staying here in the street? Why don’t you go back to your country?” We told them our houses were destroyed and we can’t go back. Other asylum seekers said that Jordanian border officials or Free Syrian Army (FSA) fighters told them Jordan was only allowing a limited number of Syrians to cross. According to their mood [the Jordanian border authorities] maybe let 50 people pass. Then they say, “No more” … The first 50 people would enter, and then they close it and say no one else can enter. The first day we were told the border was closed. The rebels made a phone call to the Jordanian side. They said, “They said for today it is enough – 60 people. You have to wait for tomorrow.” They said, “We can only take a certain amount because they [the Jordanians] gave us a quota.” Some people were waiting two or three weeks to cross. We saw them talking to [the Jordanians] on the phone … When we got to the border we saw them talking face to face but we women were far away so we couldn’t hear what they were saying. The first day we didn’t go out. The second day [the FSA] said we couldn’t go – they were trying to take the disabled and sick. In October 2012, Human Rights Watch reported on Turkey’s blocking of thousands of Syrians since August at the Bab al-Salam, Atma, and other border crossings with Syria. The same month, a senior Turkish Foreign Ministry official told Human Rights Watch that he knew that large numbers of Syrians were close to the Turkish border, but did not know whether the authorities had prevented them from crossing. He said his government was assisting Turkish groups to take aid across the border to Syrians who required humanitarian assistance but whom the Turkish government did not consider to be in danger. 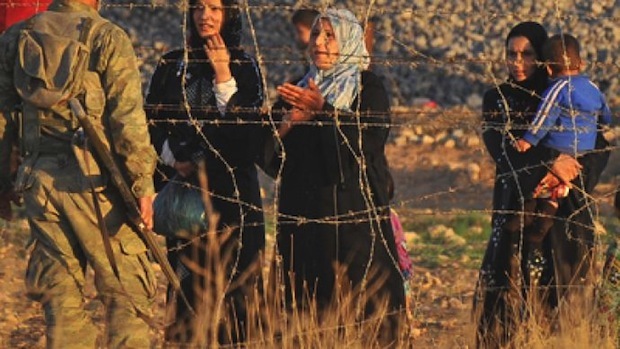 In June 2013, humanitarian assistance providers working with Syrian refugees and Syrian activists told Human Rights Watch that Turkish border guards at some official border crossings were preventing thousands of Syrians from entering Turkey, allowing only those with urgent medical needs to cross. A Syrian activist said that Turkish authorities had refused to admit 150 to 200 families at the Atma crossing in the preceding two weeks because nearby refugee camps in Turkey were full. The activist said they were forced to join the thousands of would-be refugees in makeshift Internally Displaced People camps on the Syrian side. He also told Human Rights Watch that, on June 25, the Syrian government conducted aerial attacks against the Bab al-Salam camp where would-be refugees were staying, injuring seven people and terrifying the residents. The seven injured people were allowed into Turkey for treatment, but the nearby border crossing remained closed. Following the attack, camp residents protested the Turkish government’s unwillingness to let them cross into safety. Another Syrian activist confirmed that as of mid-June, the Bab al-Salam border crossing was no longer open to Syrian refugees, leaving families stranded on the Syrian side and vulnerable to attack. The activist said some had crossed into Turkey clandestinely and were living in a makeshift camp they had set up in a public park in Killis, a Turkish town near the border crossing. Human Rights Watch said that neither a lack of space in refugee camps nor the provision of cross-border humanitarian assistance could justify preventing or delaying Syrians’ fleeing conflict access to Turkey. Instead, Turkey should immediately assist Syrians in Turkey while they are screened, and then allow them to move freely or accommodate them in open camps. Human Rights Watch said there have been less air and artillery strikes by forces loyal to President Bashar al-Assad in Syria’s border regions than in other areas. However, thousands of would-be refugees who have been denied entry to Iraq, Jordan, and Turkey are in areas that have seen and experienced aerial attacks and artillery fire, Human Rights Watch said. One aid worker in Iraq’s Kurdistan Region told Human Rights Watch in June that an increased spate of bombings and other attacks near the town of al-Rabea in northeastern Syria had made that area unsafe. The aid worker said that the attacks had led the Iraqi central government and the KRG authorities agree to close the Peshkapor crossing. Refugees attempting to cross into Jordan have recently faced danger due to fighting between the Syrian armed forces and the opposition Free Syrian Army (FSA) in the border areas. Jordanian officials have told Human Rights Watch that in May and June 2013, Syrian soldiers fired directly at refugees to prevent them from reaching the border and Human Rights Watch has previously reported on Syrian soldiers shooting at Syrians as they try to cross the border to Jordan. Refugees who spoke with Human Rights Watch in June and media reports confirm that fierce clashes took place in the border areas in late May 2013, increasing the risk to refugees stuck in those areas. The large internal displacement camps in Bab al Salam and Atma in Syria near the Turkish border have also been hit by Syrian air force air strikes, including the most recent attack on June 25 at Bab al-Salam and an attack on Atma on November 26.